Soline Dulcio was recognized at the Top Student at last fall’s Culinary Training Program graduation. Originally from Haiti, Soline struggled with depression and unemployment before applying to the program. Today she is employed full-time at the Walt Disney World Swan and Dolphin Resort as a prep cook. Thanks to the generosity of donors and supporters of the program, Soline is thriving. In the past year she has purchased a car and assisted family members with medical expenses. When her brother died of colon cancer, she was able to visit family in Miami and help with the burial. 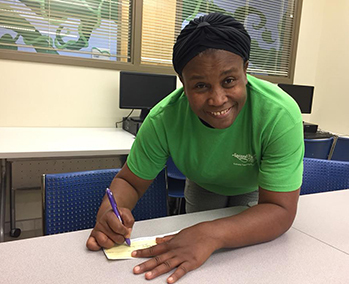 When she received her first income tax return, Soline felt a tug at her heart to give back. Learn about the different ways Second Harvest Food Bank of Central Florida is transforming lives here. Inspired to help more of our neighbors in need like Soline? Find ways to help!